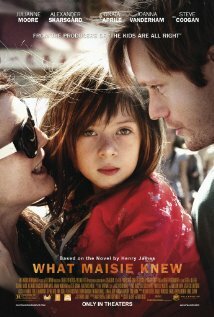 What Maisie Knew is a contemporary New York City revisioning of the Henry James novella by the same name. It revolves around unwitting 7-year-old Maisie, caught in the middle of a custody battle between her mother Susanna, an aging rock star, and her father, Beale, a major art dealer. A gorgeous film that manages to convey the emotion of childhood at its more heart-wrenching. The central performance by Joanna Vanderham is absolutely extraordinary, and reminds me of some of the greatest child performances I've ever seen on film. As her parents, Julianne Moore and Steve Coogan make you feel like you are right in the middle of the tumult of family life. Directors Scott McGehee and David Siegel have created a movie that feels like life, the vulnerability, the abruptness, the comedy, the joy. With intimacy at times almost startling, this is one of the best adaptations of a novel by Henry James I've ever seen.